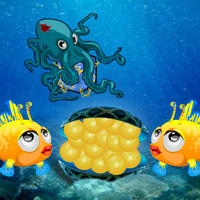 WOW Love Pearls Island Escape is another point & click escape game developed by WOWEscape. In this escape game, the boy is in golden pearls island seashore. He need to find the golden pearls in this seashore. You have to help the boy to get some clues to find out the golden pearls by finding useful objects, hints and solving puzzle. Good Luck and have fun! What a pity it was so short. Hard to see pincers in the opening scene! Nice one, but still too short. Thanks WOW. I always looked forward to WOW games but in the last while, they are very short and actually a waste of time and energy to play. What has happened? What has happened to WOW games? They are terrible now. Also TOP 10 games. Another vote for TOO SHORT!! !